Can Guinea Pigs Eat Fruit? Can Guinea Pigs Eat Kiwi Fruit? Rockmelon (Cantaloupe) for Guinea Pigs – Yes or No? Apricots for Guinea Pigs? Yes or No? Is Avocado Safe For Guinea Pigs to Eat? Is it OK For Guinea Pigs Eat Bananas & Banana Skin? 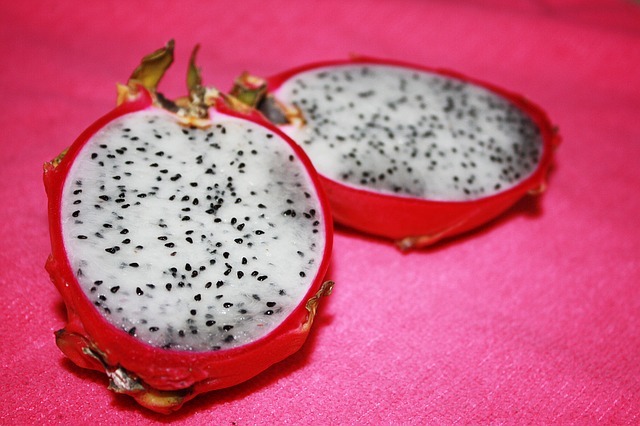 Dragon Fruit – Can Guinea Pigs Eat Dragon Fruit? Can Guinea Pigs Eat Cherries? Can guinea pigs eat watermelon rinds? Strawberry – Should Guinea Pigs Eat Strawberries? Pineapple – Should Guinea Pigs Eat Pineapple? Are Oranges Safe for Guinea Pigs to Eat? And Orange Peels? Are Pears OK For Guinea Pigs To Eat? Grapefruit – Can Guinea Pigs Eat Grapefruit? Grapes – Can Guinea Pigs Eat Grapes? 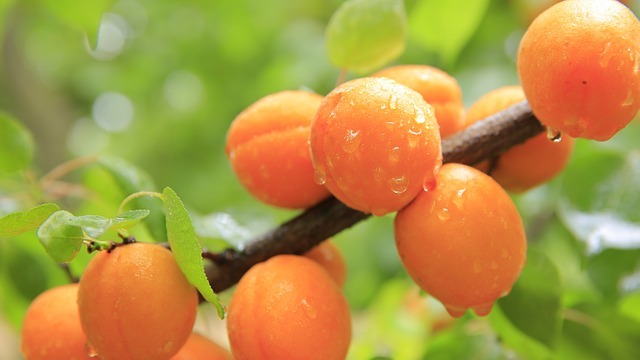 Kumquat – Are Kumquats Safe for Guinea Pigs to Eat? Lychee – Is Lychee Safe For Guinea Pigs? Mandarin – Should Guinea Pigs Eat Mandarins? 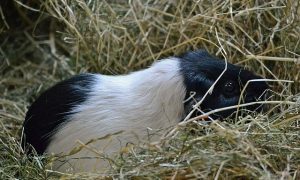 Dried Fruit – Is it OK for Guinea Pigs to Eat Dried Fruit? Guinea pigs can eat some fruit. But fruit is not a staple part of their diet. In fact, it’s not a necessary part of a guinea pig diet at all. 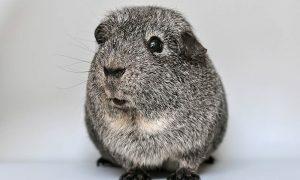 In other words, guinea pigs can survive just fine without ever touching a piece of fruit in their life, as long as they are provided with the necessities of what a guinea pig should be eating. But fruit has some benefits: Many fruits contain a lot of Vitamin C, which we know is important for our guinea pigs. And fruit can provide a fun treat. There are also downsides: fruit is naturally sugary, and this is a big reason why fruit consumption must be strictly moderated. So guinea pigs CAN eat some fruit. But they eat is sparingly; as a treat. And this guide is all about the different types of fruits we can offer our guinea pigs from time to time. 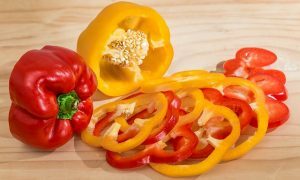 This article contains more specific information on individual fruits that you might be considering including in a guinea pig’s diet. Kiwi fruit is safe for guinea pigs to eat. Will they like eating it though? And what about the skin? What health benefits can kiwi have for guinea pigs, and how much of it is OK to eat? Like most fruits, Kiwis (although delicious) are quite sugary and are recommended as a moderately fed food or a treat. 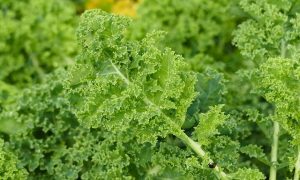 They are packed full of vitamins like Vitamins K, C and E and are also rich in antioxidants and fiber. Fiber-wise, the skin of Kiwi fruits are thought to have the most fiber of all the fruit (which is a shame for humans, after all do you know anyone who eats kiwi skin?). Guinea pigs can eat the furry skin (do wash the fruit first, of course, especially if they’re not organic) if they wish – even though it might not be your cup of tea! 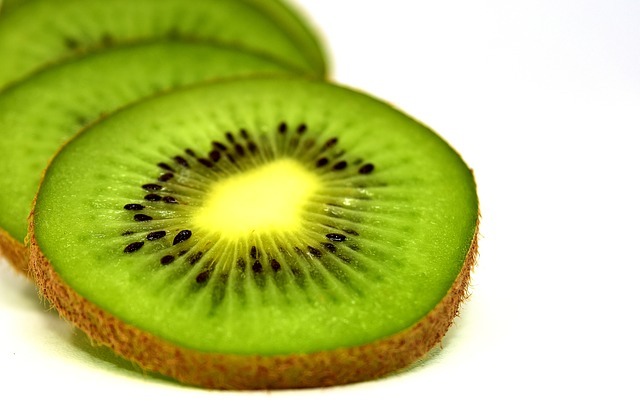 Although the universal advice is a no-seed diet for guinea pigs, a lot of fruits contain tiny seeds and kiwi is one of them. Kiwi seeds are not known to present any issues for guinea pigs. Since kiwi (and all fruit) is a very small part of the diet fed only sparingly and occasionally, a small amount of kiwi seed contained in the fruit is generally agreed to be fine. Kiwi fruit as a small part of a guinea pig’s diet provides benefits and variety – whether with the skin on or off. Along with other acidic fruits, kiwi is best offered no more than twice per week in small amounts. 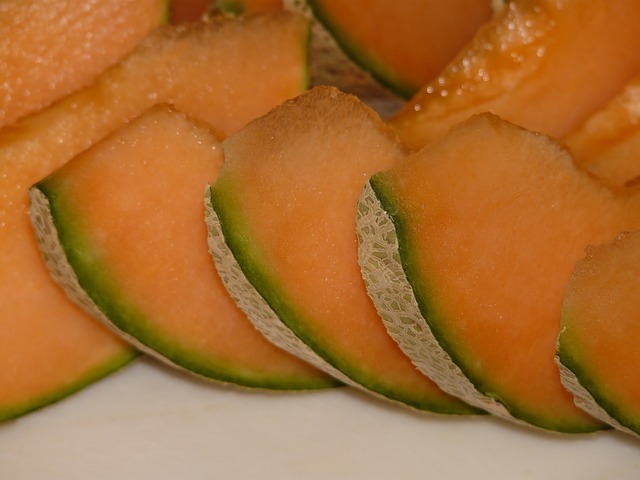 Rockmelon or cantaloupe is one of those fruits that just reminds you of summer. A nicely ripened melon of this type is both sweet and juicy. We love it – but can our guinea pigs safely enjoy a bit of rockmelon on occasion? Yes, cantaloupe is safe to give to guinea pigs to eat in small quantities. A treat of a small piece rockmelon on a warm day can appeal to some guinea pigs, and they’ll get the benefits of this vitamin C rich fruit. Many people cut a piece, leaving the rind and skin on (always wash thoroughly), which provides a great chewing opportunity as well – many people report their guinea pigs really devour canaloupe this way. Apricots are safe for guinea pigs to eat. Like all fruits, moderation is key and the general recommendation is to provide apricot a couple of times per week at the most. As you’ll likely know if you enjoy beautiful apricots yourself, there’s a large seed inside (this is a stone fruit) and that should be removed. It’s easiest just to de-seed and then cut the apricot into three or four slices on each half (depending on the size of it!). This applies to FRESH apricots only – apricot is one of the most common fruits also sold in dried or dehydrated form often in mixes containing raisins and other fruits. These also contain high amounts of sugar and often additional additives and preservatives. Dried apricots should therefore be avoided. Fresh is best and the only way to go for guinea pigs, when it comes to apricots and everything else! 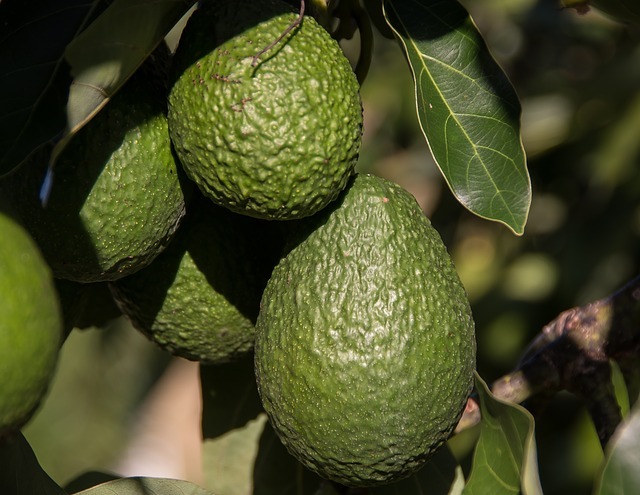 Avocado is known to be a toxic food to a lot of animals, including dogs and birds, so it’s not a surprise that people take extra precaution when wanting to know if the same applies to guinea pigs. However, all things aside, remember that guinea pigs have evolved to graze on grasses, not eat fruits. So in a purely natural state, avocados would definitely not be on the menu for any (theoretically) wild living guinea pig. That’s not what those teeth have evolved for. Avocado fruit (that is the green stuff inside the skin) is not known to be toxic to guinea pigs but not a whole is known – simply because it’s not a food that’s recommended to be included in the guinea pig diet, and there are countless other known safe and appropriate foods that can be offered as treats – therefore avocado does not need to be on the menu since, at best, it has no benefit to a guinea pig. In any case, avocados have a high fat content as well. Avocado trees or plants should also be avoided. So when it comes to anything to do with avocado and our guinea pigs: it’s best avoided altogether. 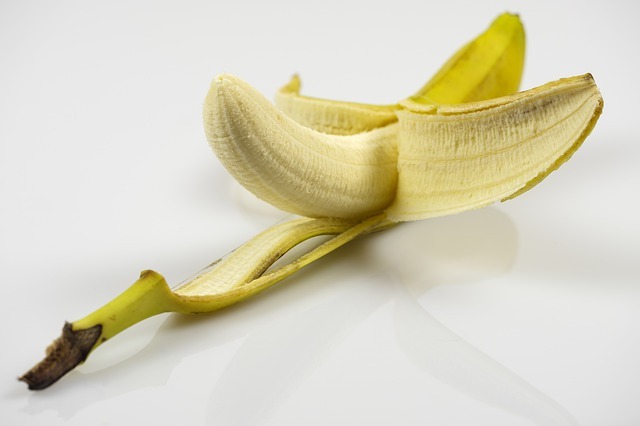 A lot of people wonder if it’s ok to include some banana peel or skin – when you think about it though, peeling a banana results in banana being left on the skin! The more ripe the banana is, the more residue of the fruit will remain on the inner side of the banana peel. Cutting a small amount of the peel off, including attached banana, is an easy and relatively clean way to provide this fruit. As with all fruit, thoroughly cleaning the outside if you intend to give your guinea pig some of the peel, is important. Better yet, if you can afford it then organic is always the way to go. It’s also been said that the rind of banana is a good potential aid for a guinea pig with loose stools. At the other end of the spectrum, too much banana can cause constipation, so a balance is important. This peel of the banana is also rich in potassium. Clearly, feeding large amounts of banana peel isn’t enticing, necessary or beneficial, but a small amount isn’t going to hurt – particularly if you can get a good amount of the fruit to stay on the skin: some people find their guinea pigs will ignore the fruit while relishing the skin and getting some of the banana fruit residue attached to the inside of the peel. Dragon fruit, or pitaya as it’s also known, is a tropical fruit that comes from some types of cactus plants. With its skin on, it’s one of the strangest looking fruits around (with a name to match). But can guinea pigs eat dragon fruit? The jury is still out on this one. We’ve found many opinions going either way. Some people think it’s fine to feed it occasionally (remember all fruits are sugary), while others put it as a do not feed due to potential digestion upsets. What about the outside of the fruit? Can guinea pigs eat dragon fruit skin? The skin of dragon fruit is quite tough and it’s unlikely anyone would want to even try consuming it – let alone it having any benefits for guinea pigs. Like all fruits, dragon fruit is an unnecessary but optional addition to a guinea pig diet which, although rich in vitamins and minerals, doesn’t form a natural part of the guinea pig’s optimal diet. An occasional treat? Perhaps. But dragon fruit is not something to make a regular on your guinea pig’s menu. Blueberries are one of those sweet fruits we can’t get enough of at certain times of year. For our guinea pigs, these little blue fruits have the benefit of being a good source of vitamin C as well as other antioxidants. But like most fruits, they are quite high in sugar so once again are one of those “feed in moderation or as a treat” type foods. A fresh blueberry or two (not frozen) make a fun, tasty weekly treat. Blueberries are consistently listed as being one of the highest ranked foods affected by pesticide residue. And that’s not a competition that is good to be ranked at the top of. 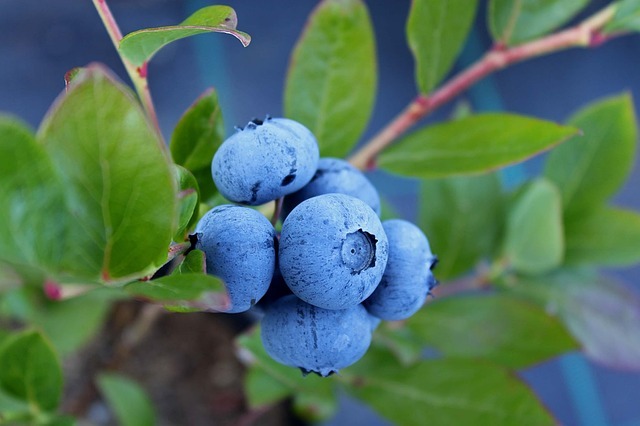 Organic blueberries are of course the best option, but these aren’t always available and if they are, may be prohibitively expensive depending where you live. Growing your own is an option to consider if gardening is your thing! Cherries are safe for guinea pigs to eat in small amounts. 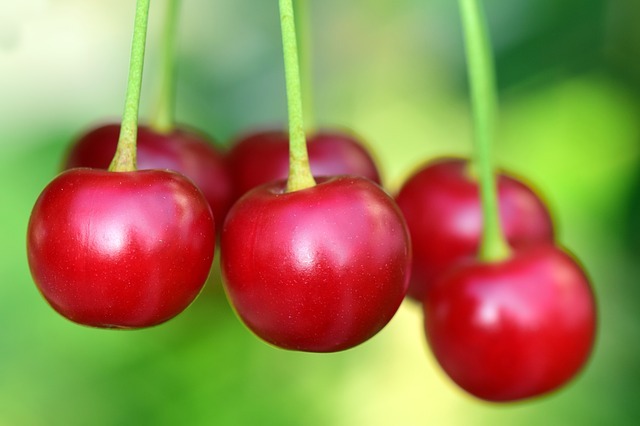 Like all fruit, cherries are sugary so need to be limited to an occasional treat no more than twice weekly. Very importantly: the seed or pit of a cherry must be removed before giving the fruit to a guinea pig. This large cherry seed is a choking hazard to guinea pigs. Guinea pigs have been known to swallow cherry pits and this has two major risks: obstruction and toxicity. This hazard is so easy to avoid by simply never allowing guinea pigs to have a whole cherry with the pit/seed inside. 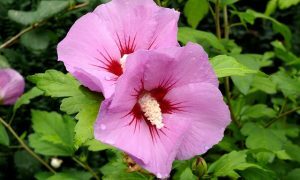 Cut it in half, remove the seed – and eliminate the risk! Watermelon is safe for guinea pigs to eat. Like most fruits, it’s recommended that watermelon be offered on a very limited basis: most people are comfortable with a small amount twice per week. Watermelon, as you’d assume from its name, has a large portion of it being you guessed it.. water. It’s also quite sugary. So in line with the recommendations for feeding fruits to guinea pigs, limited amounts is the way to go. A lot of people find that their piggies absolutely love watermelon – so it’s easy to be over generous in feeding it. However, we need to resist the temptation to do so. The large black or brown seeds in watermelons should absolutely be removed before giving a piece to your guinea pigs. Some of these can be hidden relatively deep in the flesh of the fruit, so paying attention is important. 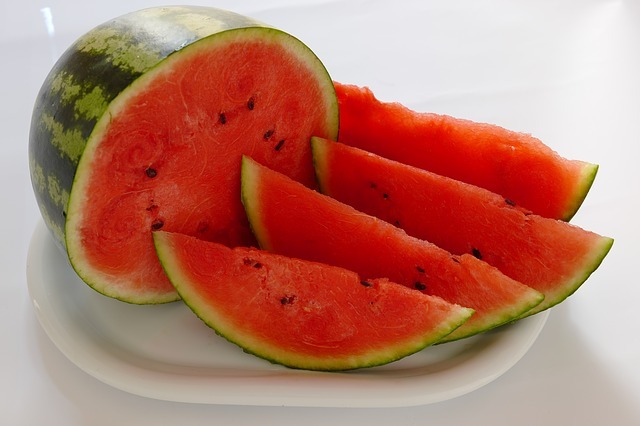 The lower half of watermelon, closest to the skin, normally contains less or no seeds. Feeding this part of the melon is ideal, and it also makes it easy to leave the rind intact. On that note..
Watermelon skin or rind is safe to give as well, and makes it easier to cut into small pieces (an inch or two in size per guinea pig is a good guide). Naturally, making sure the outer skin is well washed is essential. WAshing before cutting is the best thing to do, and reduces the amount of anything that might slice through with the knife. Some guinea pigs will eat skin, rind and all and it provides a good gnawing opportunity for their teeth. Freezing small cubes of watermelon and giving them as a treat on a warm day (or any time), goes down like a well, like a treat! Should you give custard apples (also called cherimoya) to guinea pigs to eat? 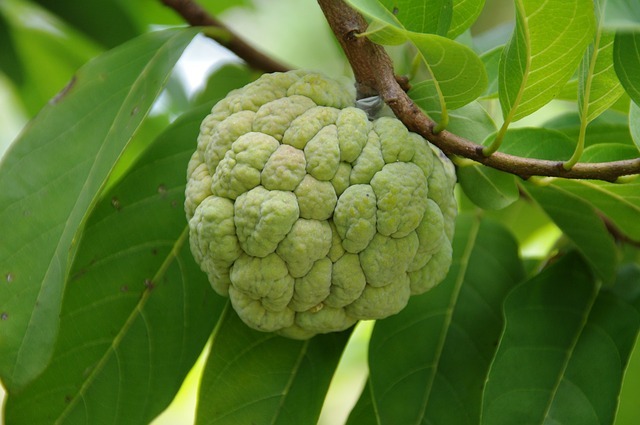 Depending where you are, your local custard apple varieties might be either one of sugar apple (Annona squamosa) or the cherimoya (Annona cherimola), or it could be a hybrid of both. In any case, the appearance is relatively the same whatever variety is available to you where you live. Despite the name, the custard apple is very much a fruit and does not contain any custard. The name simple comes from the inner texture of the fruit’s flesh which must have reminded someone, long ago, of custard! While the fruit itself is shaped similar to an apple. So is custard apple, sugar apple, cherimoya or whatever it may be called where you are, safe for guinea pigs to eat? This is a food that is in the “not entirely sure” department when it comes to safety and suitability for guinea pigs. For most people that means giving it a miss, and not taking any unnecessary chances when we have so many certain-safe foods available. As you might guess by one of the names of this fruit, sugar apple, it does contain a good amount of sugar which is one of the reasons most people are more comfortable not providing it in the diet at all and instead focusing on foods that are known to be 100% safe and beneficial. Custard apple is not toxic to guinea pigs, but its sugar content is likely to be the most questionable part of whether or not one feels OK about feeding it as an occasional treat. On the upside, cherimoya or custard apple does contain a fair amount of vitamin C (21% per 100 grams), good levels of dietary fiber at 3g per 100g or 12%, and a tiny amount of calcium. 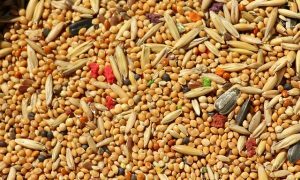 Although this pertains to humans, and we do not know if it translates to the same with guinea pigs, it is absolutely important to note that the skin and seeds have shown to be toxic to people. The seeds of this fruit are also very large and should never be provided to a guinea pig. Guinea pigs can eat strawberries, and they can also eat the green leafy tops of strawberries. Most guinea pigs will enjoy the tops more than the rest of the fruit! But: strawberries are a fruit, and fruits are only suitable for guinea pigs in strict moderation. A once or twice a week strawberry treat is considered ideal for a guinea pig. Unfortunately strawberries are at or near the very top of the list when it comes to pesticides use! This means that unless you’re buying purely organic strawberries or growing your own with no use of chemicals, then it’s certain that the strawberries you’re buying have been exposed to toxic chemicals on the farm. On the Dirty Dozen list of pesticides in produce for 2018, strawberries come out at number one on the list again! 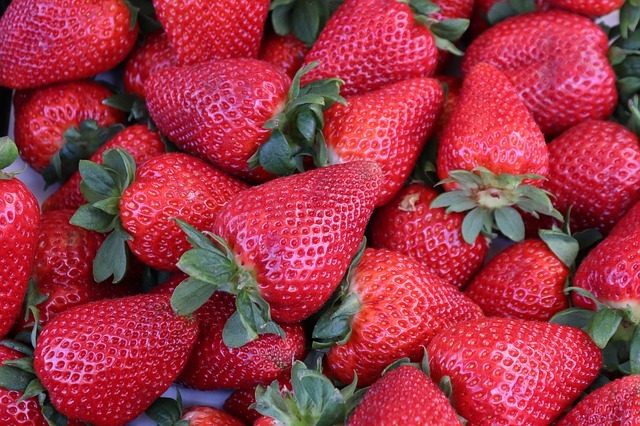 The Environmental Working Group tested many strawberry samples and found that most of them contained a massive 10 or more types of pesticides – with some containing up to 22 different varieties of pesticide residue. So the moral of the story is: be mindful of where you’re getting your strawberries from and whether you consider them safe for guinea pigs to eat (let alone safe for yourself to eat). 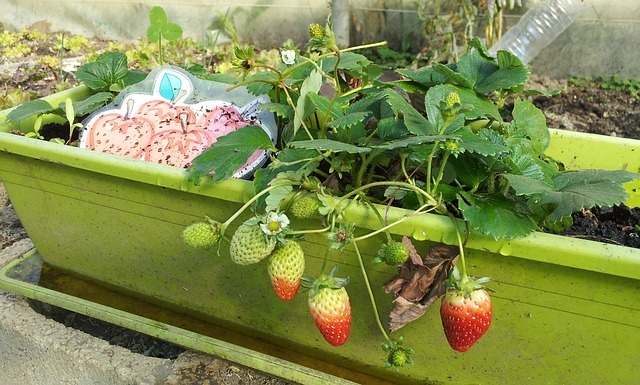 Fortunately strawberries are VERY easy to grow yourself, and can be done even if you have no garden space at all. Strawberries can be grown in pots and are a popular hanging basket plant. You’ll get to enjoy delicious fresh strawberries (which taste considerably better than anything store-bought), and you will have the peace of mind that your strawberries are not covered in toxic chemicals. Pineapple for guinea pigs? Yay or Nay? This fruit is quite acidic, and sweet (think: sugary), but some guinea pigs do enjoy a nibble on it occasionally in very small amounts. Like most fruits, the consensus is that a small treat once or twice a week is acceptable. Some people take a much more conservative approach and offer pineapple as a once or twice monthly treat. 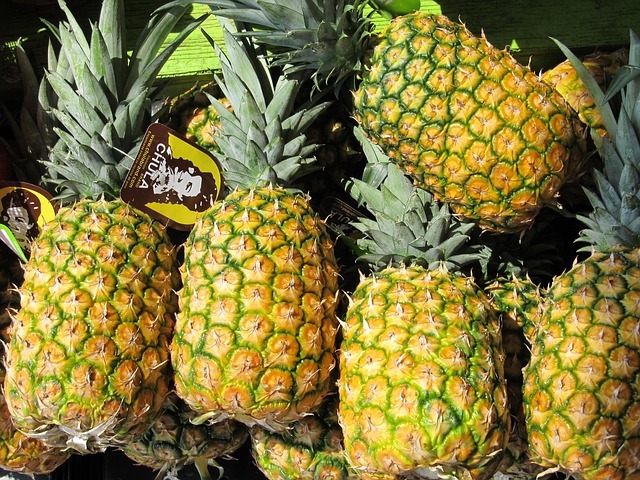 Because of the acidity of pineapple, too much can irritate the mouth of a guinea pig and cause sores. If you’ve ever indulged in a little too much pineapple yourself, you would know the effect it has on the roof of your mouth – not a pleasant feeling! Avoid the leaves of a pineapple. They are sharp and not palatable. The same goes for the skin. Needless to say: canned pineapple is not appropriate for guinea pigs – it often has even more sugar added as a preservative. Tomatoes are OK for a guinea pig to eat in small quantities. That is, the fruit (it is a fruit remember) tomato – the part we eat. The reason one needs to be completely clear on that is because the actual tomato plant is toxic and should never be given to, or allowed near guinea pigs (or pretty much any other pet). So if you’re growing your own tomatoes (lucky you! ), absolutely do not just cut a section of plant off and give to guinea pigs – only pick the ripe fruit. So on the subject of tomatoes themselves, what potential risks are there if you provide them too often? Being quite acidic, they could cause irritation to the mouth if fed too often. People seem to be most comfortable provide a small amount of tomato once or twice per week at most. Are there any particular types of tomatoes that are better than others for a guinea pig? The smaller tomatoes like cherry tomato, baby plum tomatoes and sometimes grape tomatoes are more holdable and these are the types that a lot of people choose to give as a treat rather than cutting up big tomatoes. What about the seeds, or pips inside the tomato? The general consensus is these are ok, as they’re particularly tiny in the small tomato varieties. Larger tomatoes can have bigger seeds and some people feel more comfortable if they remove them. And canned tomatoes? These are not going to be beneficial for a guinea pig, not least because they usually have added salt and potentially other preservatives in the can. Tomatoes should be a ripe red color before you think about feeding them. 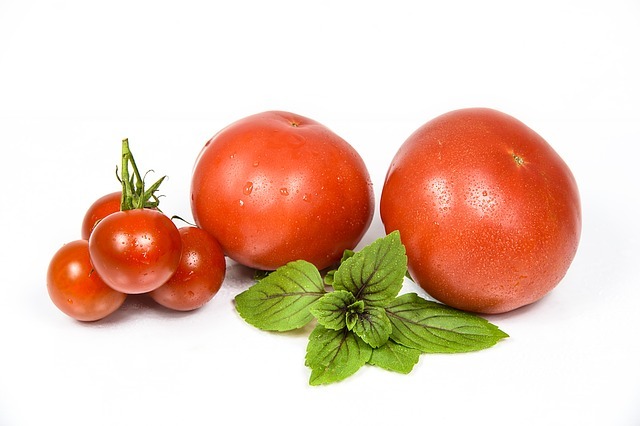 When tomatoes are young, which is when they’re still green or not fully red on the plant, they still contain high levels of the toxins that make the rest of the tomato vine off limits. As the tomato ripens, this toxin becomes less and less concentrated: and that’s when we and our guinea pigs enjoy tomatoes – when they’re a wonderful ripe red. We know guinea pigs need a good amount of vitamin C in their diet as a high priority. We know orange fruits are one of the best known vitamin C containing foods out there. But are they suitable for a guinea pig to eat? It’s safe to provide some cut up orange to guinea pigs, although many will not take an interest in it. Like all fruits, oranges have a high sugar content so moderation is the order of the day. As with all fruits, they only make up a very small portion of the overall diet. Orange peels can be provided to guinea pigs, but there’s no guarantee they’ll take an interest in them. Needless to say, these should be thoroughly washed before serving. How often can you offer orange skin? The general consensus is no more than 4 times per week at a maximum, although many recommend only twice per week. You will soon get an idea if you’re guinea pigs are at all interested in orange peels, because many are not (after all, they don’t really look like food!). A lot of people who offer oranges to guinea pigs do in fact find that they’re more interested in the peel than the fruit of the orange. Pears are a relatively high fiber fruit, contains no Vitamin A and does contain some Vitamin C.
Guinea pigs can eat pear, but like all fruits it should be considered a treat fed in moderation only. 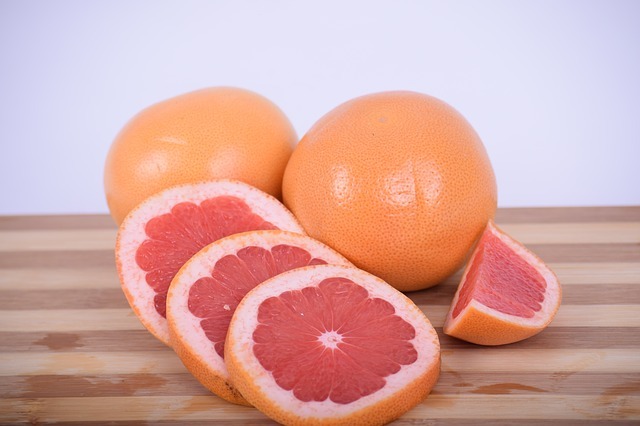 Grapefruit is a type of citrus fruit, and citrus is well known for its richness of vitamin C. That’s great for guinea pigs; but like all fruits, grapefruit also contains natural sugar (fructose) and so is a food that is only to be fed in occasional moderation to guinea pigs. Although grapefruit is one of the less sugary fruits out there, it’s still considered high in sugar for guinea pigs. Additionally, being a citrus fruit, grapefruit is acidic; something else that guinea pigs need to avoid as much as possible. In short: grapefruit is OK for an occasional treat for guinea pigs to enjoy (some will love it, others won’t want anything to do with it!) – but it’s not intended to be a regular or large part of their diet. Guinea pigs can eat grapes that contain no seed in them. 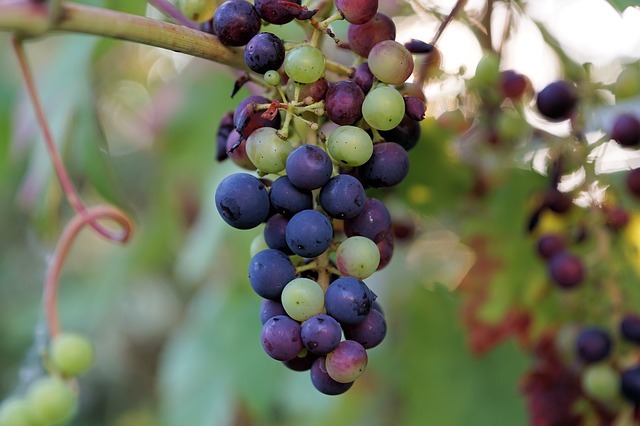 There are two main types of grapes we can buy: seedless and those with a seed inside. Seeds are dangerous for guinea pigs, so only seedless grapes are worth considering for guinea pigs. We know that grapes are a high sugar fruit (as most fruits are). In fact they have about 16g of sugar per 100g of grape. This means, as with fruit in general: Moderation. A bit of grape a couple of times per week as a treat is considered OK for guinea pigs. Guava is a tropical fruit that is high in Vitamin C. While that’s a good thing, it’s still a fruit and thus generally recommended only fed to guinea pigs in moderation and/or as a delicious treat. Kumquats are a citrus fruit. They kind of look like tiny oval oranges – except the skin is edible. 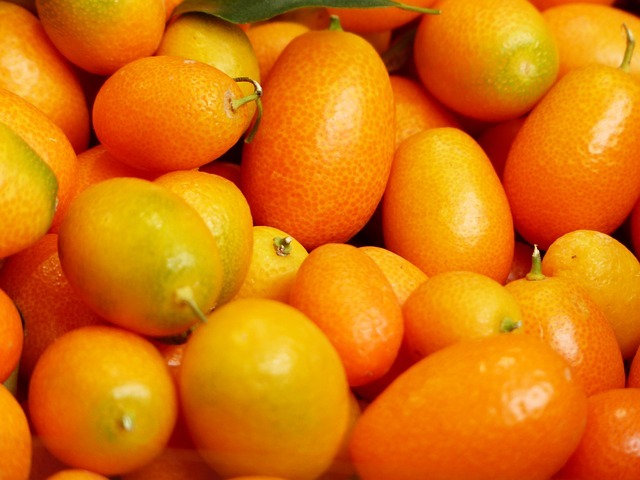 Like all citrus fruits, kumquats contain vitamin C, although not as much as some other citrus. But also like all citrus fruits and fruits in general, strict moderation is needed for guinea pigs. 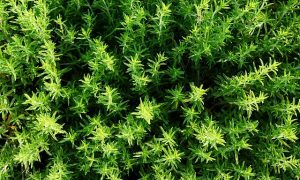 If your guinea pigs even like them (some will, others won’t), then the recommendation is no more than once or twice per week to provide one small kumquat – maximum. Lemon and limes are citrus fruits so are naturally high in Vitamin C – a big tick for guinea pig health requirements. 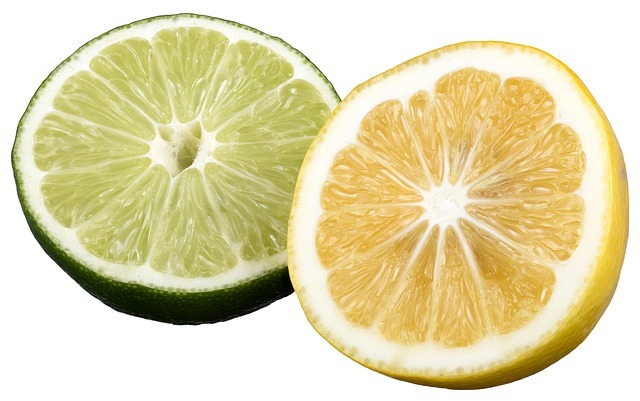 Lemon contians almost double the amount of vitamin C compared with lime though. But unlike that other famous citrus fruit, oranges, limes and lemons are not normally eaten completely, but rather used as flavoring in foods and drinks. We all know how bitter lemons are, with limes a little less bitter but still signifianclty more bitter than other citrus. Limes tend to taste more sour. This bitterness tang comes from the high amount of citric acid in these friuts. So enough about what we think of limes and lemons: what do guinea pigs think and are these fruits really suitable for them at all? Not surprisingly, a guinea pig will find lemons and limes very bitter or sour just like we do. It’s unlikely they would want to have any more than an initial taste of a lemon or lime before finding out just how bitter it is; if they’re even game to do that. Limes and lemons are not ideal food offerings for guinea pigs. Many other fruits provide much more suitable and desirable options; for example, a small amount of grapefruit is often highly relished! Lychee is one of those strange fruits, and they aren’t appealing to a lo of people. It has its benefits though, and being rich in Vitamin C is one of them. Does that mean lychees are OK for guinea pigs to eat? Lychee are safe for guinea pigs. Whether they would want to eat them or not? That’s another matter. But like all fruits, the sugar content of lychee must be considered. Therefore, considering it as an occasional treat food is the way to go. Naturally this means only fresh lychee fruits – canned fruit of any type must be completely avoided. Mandarin is a citrus fruit. It’s considered one of the least acidic of citrus fruits and of course, contain vitamin C in the form of ascorbic acid, like all citrus fruits. Should guinea pigs be eating mandarin though? As with all citrus fruits and fruit in general, the recommendation is that they be either avoided or only provided in occasional very small quantities. 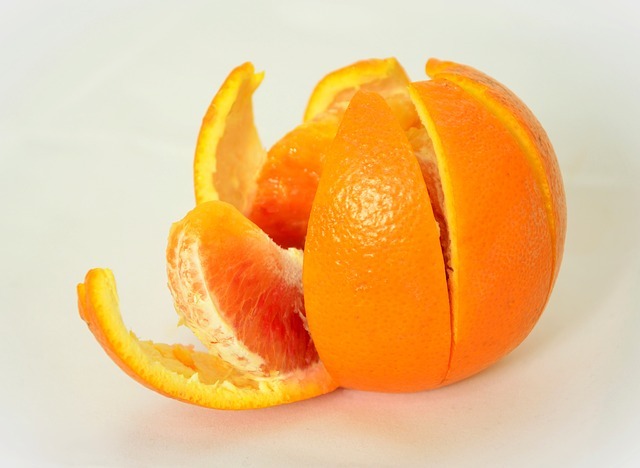 And when it comes to mandarins, the relatively large (and sometimes hidden) seeds need to be removed to avoid a choking hazard. What are the nutrients found in mandarins? Dried fruit is regular fruit that has been dehydrated or dried using another method that removes almost all the water of the fruit. This sounds well and good, but a major issue with the commercial dried fruits sold for human consumption is that they very often have vast amounts of sugar or other sweeteners added, such as corn syrup. Other additives and preservatives can also be included, and it can be a shock to read the labels on some of these dried fruit products. Some of the most common dried fruits are cranberries, banana, apricots, raisins, fig, apple and more exotic fruits like goji berries. Fresh is best: but if you are really considering providing some dried fruit as a treat, consider it as only a very occasional treat consisting of a small raisin or fig piece once a month. And vitally: only buy products that have no added sugar or other additives. Because dried fruit is not considered an ideal or really beneficial food for guinea pigs, most people feel comfortable just foregoing them completely and focus on fresh foods that are part of a proven, reliable, healthy risk-free guinea pig diet.